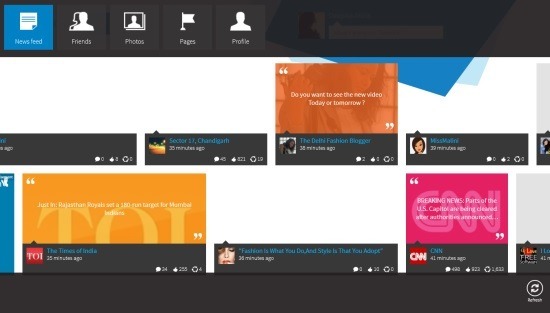 SocialNV is a free Windows 8 Facebook client app available under ‘Social’ category of its app store. This Facebook client for Windows 8 is the most sophisticated Facebook experience on Windows 8 that lets you browse your Facebook news feed with fast interface, post comments, photos, links, and tag friends, everything from within the app. SocialNV app for Windows 8 has been designed by after keeping in mind from the core Windows 8 features to provide you the best FB experience on Windows 8 platform. As you right-click anywhere on the screen, you will find the navigation bar appeared at the top of the screen including options like News Feed, Friends, Photos, Pages and Profile. You can easily jump to other sections such as to friends or to profile page through the top navigation bar. This Windows 8 Facebook client app has an integrated Share Charm from where you can share your links, photos, and much more to other apps via SocialNV. Also, you can directly update your Facebook status through this Facebook client Windows 8 app. Let me quickly point out the main features of this Facebook client for Windows 8. Most sophisticated Facebook experience on Windows 8. Lets you browse Facebook feeds with fast interface, post comments, photos, links, and tag friends, just everything. Availability of effective navigation bar with options such as News Feed, Friends, Photos, Pages and Profile. Comes with an integrated Share Charm from where you can share your links, photos, and much more to other apps. Lets you update your Facebook status from within the app. Lets you easily switch to snap view so that you do not miss even a single feed. Also, check out posts on Ftalk, Photo Uploader for Facebook, and Facebook Client Apps. Well… I found this Windows 8 Facebook client app really interesting as your can experience the Facebook in all new way. The interesting part is that SocialNV shows updated status and notifications on the lock screen, But make sure that you have enable the settings for the same. It’s really easy to download SocialNV app in Windows 8. All you need to do is just open the given link in IE10 and click ‘View in Windows Store’. Now, using the ‘Install’ button you can easily install it in your Windows 8 system. There you go… Go ahead and experience the new way of accessing Facebook! Windows 8 Facebook Client App: Facebook HD Pro!